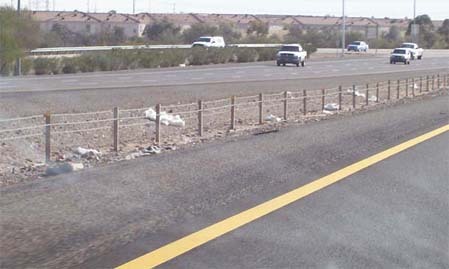 Arizona has some of the most littered highways in the U.S. Back in 1995 I drove past an aluminum contractors ladder that had fallen off a truck and been repeatedly run over by traffic in Phoenix, just north of the I-10 and highway 51 interchange for over 30 days. 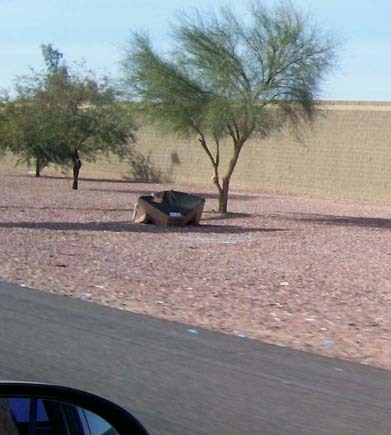 I have seen couches and other furniture remaining on the highways for weeks at a time. Don't believe me? Want proof? 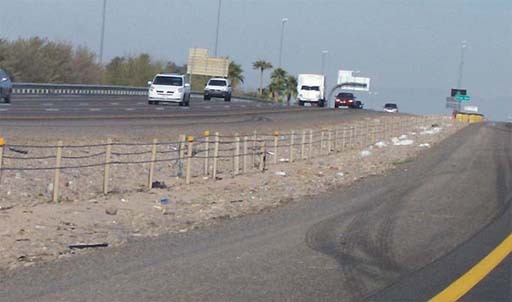 Below is a guided tour of the trash found on a 70 mile round trip from Goodyear, AZ. 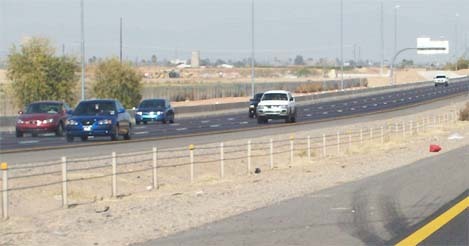 to the Metrocenter Mall via I -10 and Highway 101 which took place on January 29th, 2006 at 11:00 am. 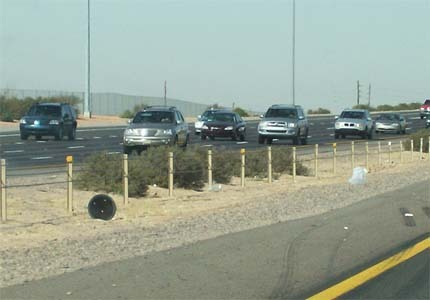 We returned using the same highway. This day was selected at random. No attempt was made to catch the roads on a bad day. In the event you can't figure out what your looking at I'll fill you in. The picture above is a child's mattress. 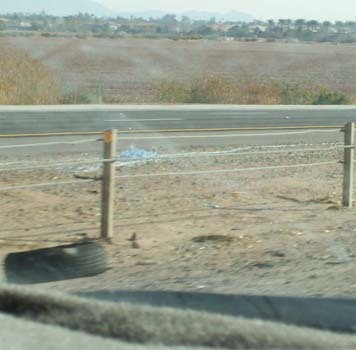 A tire carcass and some plastic debris. A pink plastic bag, a blue engine oil bottle and some assorted paper and plastic items. Plastic sheeting and other assorted trash. A red plastic bottle, tire carcass and 5 gallon bucket with other assorted debris. This ones my favorite. The corner section of a sofa suite. 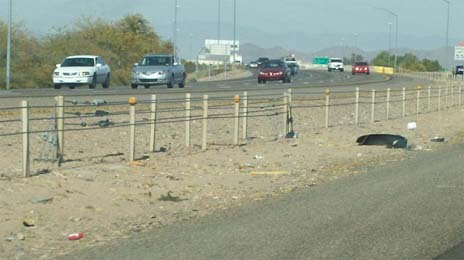 With the large amounts of furniture on the side of the highways and the large numbers of people moving their furniture, I can't help but contribute this, to the lack of job security in Arizona. Regardless of the actual cause, it is obvious that there is a tremendous lack of security in life here. 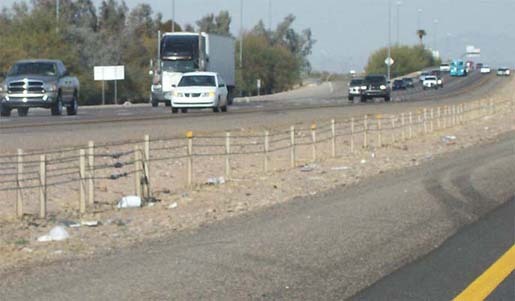 Because on any day you drive the streets you will see at least one person moving, if not more than one. Nobody likes to move their furniture and puts forth great effort to avoid doing it. So why are so many people moving if it is not due to a lack of job security? I hope they didn't stay in the pool too long. 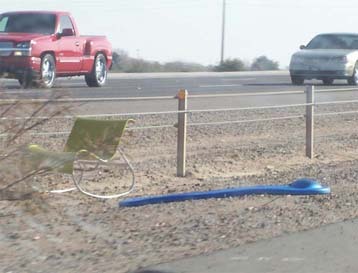 An outdoor chair and a foam pool raft. 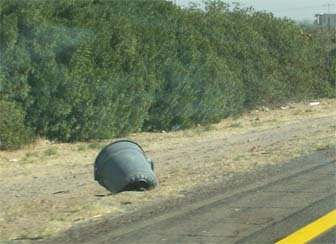 A plastic bucket and a complete tire. Too bad somebody didn't put this trash can to good use. A yellow plastic bucket and assorted trash. A plastic pot for garden plants and a plastic bag floating with the wind. A black piece of trash, red plastic gas can and some plastic sheeting. 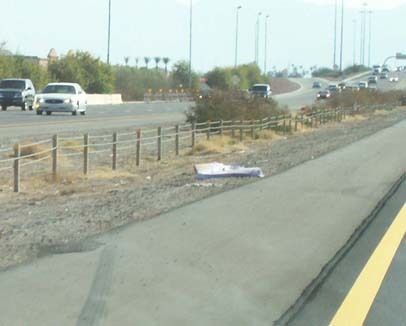 A pile of magazines and newspapers dumped at the Estrella Parkway off ramp. 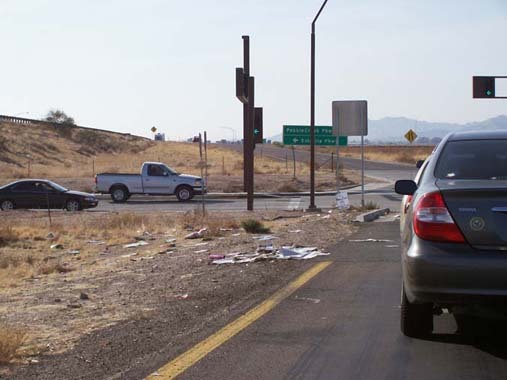 This concludes your guided tour of the trash along I -10 and Highway 101 which took place on January 29th, 2006 at 11:00 am. We hope you liked what you saw!